The author of The Ecstatic and Slapboxing with Jesus shares about what happens when his family encounters his fiction. I rather admire his level-headedness, and what seems to be an easy-mannered 'get to work' sensibility about writing. Would I but possess a smidge of his temperament. Who can resist Granta's headline? The U.S. Supreme Court has arranged Kafkaesque standards for people to sue for pay discrimination. For decades, the legal principle was that every paycheck was a violation if it was based on a discriminatory pay system. That's been reversed, with a recent decision against Lilly Ledbetter, who was a plant supervisor with Goodyear Tire & Rubber. Now, you get a single shot to file the lawsuit: immediately after the discriminatory pay decision was made. What, that was decades ago? What, you weren't aware that your counterparts were systematically paid more than you for the same work? Too bad. "What’s more, Ginsburg notes, Ledbetter had proved to a jury that her lower pay was due to 'a long series of decisions' reflecting Goodyear’s 'pervasive discrimination against women managers in general and Ledbetter in particular.' At one point, Ledbetter’s pay had fallen below that of Goodyear’s minimum threshold for her position. Yet under the high court’s May 2007 decision, the discrimination Ledbetter proved to a jury is 'not redressable' under the law because she did not file a lawsuit after the initial decision to pay her an illegally low wage." What I think is especially pertinent here: I doubt there was a nefarious committee at Goodyear that decided they would *officially* offer Ledbetter less pay for the same work. The fact that she started out on the same plane with her male counterparts reveals that. But over time, moving through seniority and raises, through the series of small decisions in Goodyear management that amounted to a substantial and unjustified loss to Ledbetter (note: the Supreme Court did not find that Ledbetter's claims of discrimination were false; she lost on a technicality of timing, it seems), the expectations of the company on the capabilities of people of different genders was revealed. That is, I suspect people who'd never believe they were sexist--possibly a group of both men and women--ultimately expected less from Ledbetter because of her gender. And they paid her accordingly. This is what workplace legal protections are supposed to do: to be a guard for us against damages that may be unintentional but are damning. When something's all around you but you can't say 'there' (to paraphrase Ani DiFranco). What's more: it turns out that Senate Republicans used a filibuster to block a measure that would've challenged the Supreme Court's ruling. What's more: presumed presidential nominee John McCain revealed total ignorance about the matters of pay discrimination by nimbly offering the suggestion that women just need more "education and training." That said, it's worth noting that April 22 was Equal Pay Day - the day that marks how long into 2008 that women have to work to make the same amount of money as their male counterparts did in 2007 for the same work. "According to the 2006 Census Bureau, women on average earn 77 cents for every dollar paid to their male counterparts. For women of color, the wage gap worsens: African American women make 66 cents, Latinas make 55 cents and Asian American women make 80 cents." In Michigan, I happen to live in the state that ranks 47th in pay equity. The average female Michigander earns 69.8 cents for every dollar made by a man. First there was the Museum of Modern Ice, now there's a new exhibition at The Field Museum: "Melting Ice -- A Hot Topic: Envisioning Change." Twenty-six artists from ten countries contribute a range of art pieces--from photography to paintings to installations to sculpture--that circle around climate change. Special emphasis is on the melting ice caps, natch. The exhibition runs until September 1. Gary Snyder wins the $100,000 Ruth Lilly Poetry Prize for lifetime achievement. Christian Wiman, chair of the prize's selection committee, had this to say in the press release: "Gary Snyder is in essence a contemporary devotional poet, though he is not devoted to any one god or way of being so much as to Being itself. His poetry is a testament to the sacredness of the natural world and our relation to it, and a prophecy of what we stand to lose if we forget that relation." Snyder is also a committed Buddhist and environmentalist. How Do You Tell An Awful Story? That's the question that leads off my new article at RH Reality Check. Honestly, I feel like the stakes of this piece were about as high as any I've written. 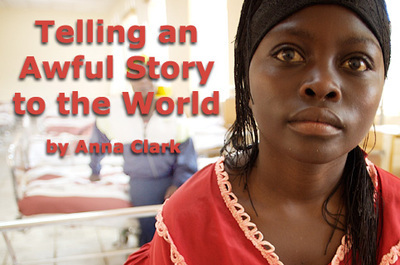 How do you tell an awful story to the world? ... A lot of people are working to alert the world to a gruesome reality that's simmered for more than a decade in silence. But in a global context where humanitarian crises are too common, and where the concerns of both African nations and women are hardly centered in media and government, how can the DRC's story be told to incite compassion in the massive proportions necessary for change? The fourth in a series. Catch up on other Detroit Stories here. So, I haven't actually been to the Allied Media Conference yet. But I've watched it enviously from afar for a couple years now. And now that I'm here in Detroit--the national conference's native ground--I wouldn't miss the 10th annual for anything. 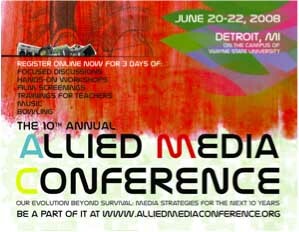 "The Allied Media Conference cultivates media strategies for a more just and creative world. Held every June in Detroit, MI, it is the primary point of intersection in the U.S. for alternative media makers and committed social justice activists from around the country. "We come together to share tools and tactics for transforming our communites through media-based organizing. The panel discussions and workshops of the AMC are hands-on and practical, intergenerational while youth-centered. They showcase the solutions emerging from places where creativity is a matter of survival. Out of the AMC, we evolve new skills and strategies to bring back to our local contexts. We deepen our relationships and expand our networks in ways that support ongoing collaboration throughout the year." I've heard tell of the unusual interactivity, innovation, and do-it-yourself ethic at AMC--not to mention a deep commitment to this city. And as I scour the program listing for updates, I'm seeing Detroit Summer's Live Arts Media Project leading a session on "people's statistics" and participatory research. I'm seeing Appalshop and Radio Rootz others explore youth media. There's "Social Justice & Zine Making" and "Burlesque & the Commodification of the Sexual Imagery of Woman of Color" and a session on using Google maps in community organizing. There are films, bowling, live music, and an always-open media-making lab (that is "a hotbed of hands-on skill-sharing from beat-making to transmitter-building") for folks to play and learn throughout the weekend. "The tracks at this year’s AMC are: the INCITE! Women and Trans People of Color Media Track, the How-to Track, the Media Policy Track, the Popular Education Track and the Youth Media Track." But perhaps what most makes AMC stand out is the manifestation of its intentions. A few months ago I went to a conference in Washington D.C. It was held at the Marriott, where participants were expected to stay (and pay). Attendees were mostly suit-wearing sorts who whipped out their business cards when you least expected it. Most of them were talented and visionary people, but when you put them in a session, the ideals for new community models were crammed in archaic teaching models: four person panel, each one who reads from his or her power point, a couple stuffy questions at the end that was a gesture towards "interaction." I hated it. I was disappointed that these folks who were doing brilliant work in re-imagining what our cities and towns can look like directly contradicted their goals by sticking to old ineffective patterns and setting up the conference to be limited to a white, well-off, professional class (which made our talk about building 'diverse communities' laughable). AMC, on the other hand, offers a range in pay scales for attendees. Rather than pay for hotels, there's an arrangement with Wayne State University to use dorm rooms. Or, attendees can take advantage of crash space with locals at the conference (I signed up to offer this, as I'm only a few blocks away). I expect to see very few power points in AMC sessions. And, not coincidentally, there's a healthy range of talented folks who make this event happen. Why is the Allied Media Conference a reason I love Detroit? I love the substantive engagement AMC has with the city--not only by committing to live here, not only with its partnerships with local creatives and activists and local independent businesses, but with its vision of place. "When Detroiters talk about our problems, we often blame the corporate media for projecting a negative picture and causing people to lose faith in the city. Detroit's worst problems of poverty and violence are often emphasized in corporate news reporting. Films like Robocop and The Crow have used Detroit as an icon of post-apocalyptic collapse. We have been victimized by images. "But we have the capability to take charge of our images. We can use media to project a new image of what is possible, to tell the stories beneath the surface, and to forge new connections with one another. The ... Allied Media Conference is a unique opportunity for us to reflect on what independent media means to a city like Detroit." As well, AMC chronicles Detroit's strong history of independent media. I love that. I love that I might be part of it, that I have an opportunity to interact, in a most rare way, with amazing folks who live far from me and down the street from me. I love that the city I'm living in now comes to mean opportunity, hope, celebration and possibility in this context. And I expect to have plenty of my expectations on media, community and movement building thrown asunder. I can't wait. "With print revenue down and online revenue growing, newspaper executives are anticipating the day when big city dailies and national papers will abandon their print versions. "That day has arrived in Madison, Wis."
Do You Know Johnny Hiro? 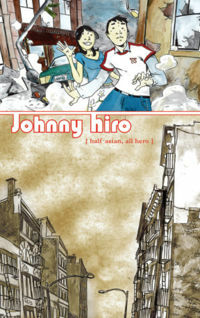 Well, you should: Johnny Hiro (half asian, all hero) is the new comic book series that's nominated for four Eisner Awards. Which, I've learned, is basically the Grammys of comics--and it's way spectacular for an indie title to be tied for the most nominations in a stew of DC and Marvel books. Not to mention that these are top-tier nominations: Best New Series, Best Single Issue, Best Writer/Artist-Humor, and Best Humor Publication. Get in on the Chao bandwagon now. You won't regret it. You might've noticed that I've been posting a lot of video from remarkable live performances lately. You might've wondered: what the hell? Is Anna just posting every cool clip she comes across in her YouTube surfing? And so it seems worth mentioning why I've been obsessive about hunting down great music performances (no seriously: we're talking an extraordinary number of hours spent seeking them online). As a writer and a reader, I think that I often neglect other forms of storytelling. Sure, what human being doesn't love music? Or art? But I've submitted too much to our culture of 'speciality', where one sticks with what one is good at and rarely offers much more than an approving nod to other arts. God forbid we participate in an art form that we haven't *trained* in; we might look foolish. I don't play any instruments, I have hardly more than a generalist's knowledge of music history (in any genre), I don't know the specific language to articulate how a piece of music works (um, the major fall, the minor lift?). I majored in art history alongside writing in college, but with the specific intent to use art history as a vehicle to become a better writer. While I think I succeeded at that, my artmaking skills are basic at best and my knowledge of art history remains--literally and metaphorically--undergraduate. And so, while I'm prone to indulging in the joy of a concert or making fab playlists for people I love, or trotting down the couple blocks to the Detroit Institute of Art and the MOCAD, I've still distanced myself from these art forms. Maybe I think subconsciously that I need to be an expert or peculiarly talented to have the right to participate. Maybe I fear being judged--and god knows there are a lot of people who have little respect for those who don't have a comparable level of music knowledge and skill as themselves. Why go to a concert if I haven't memorized what song is the third track of the musician's fourth album? Why sing if I can't sing well? These days I'm been thinking about it anew. Fact is, I'm interested in what folks have to say about books no matter where they're coming from. I may agree or not, but if you've got passion for stories, let's start talking. And it's true; live performances are a form of storytelling--one of the best kind. If it's words I feel comfortable with, I can at least understand this. Maybe this'll be the pivot point for me to come to a place where I own the relationship I have with music, even among ridiculously talented friends. The music I've shared with you are performances that hit me in the gut. They're stories told with words made physical, a human energy embodying tales with a force that thrills. I dare you not to feel your skin chill at Jennifer Holiday's performance of "And I'm Telling You," from the musical "Dreamgirls" at the 1982 Tonys. I dare you not to startle to attention at Melissa Etheridge's version of "Piece of My Heart" at the 2005 Grammys--her first performance after going into remission from breast cancer (which she doesn't hide), and edged with her whole-bodied delight in performing music. And yeah, even though I'm not a guitar player, I'm gonna say it: Nancy Wilson's solo intro to Heart's "Crazy On You" is just one more indicator that she's one of the greatest rock guitarists you'll ever be so lucky to hear. (Anne Wilson's vocals are nothing to sniff at either). There'll be more coming. Consider this the beginning of a new series at Isak: storytelling on stage in the best live shows we can see together. I look forward to your suggestions as well. 'What Becomes of the Broken-Hearted,' a fantastic bluesy version of the classic with the Motown house band--the musicians who earned more number one hits than Elvis Presley, The Beatles, The Rolling Stones and The Beach Boys combined. And no one knew who they were. That is, until the documentary "Standing in the Shadows of Motown" was released a few years ago. It's a wonderful film that should be required viewing for any lover of music. The talent within The Funk Brothers--who played in Studio A of Hitsville USA on Detroit's W. Grand Boulevard from 1959-1972--was almost entirely uncredited, and I was among those who were clueless. Since the film's release, The Funk Brothers won a lifetime achievement award from the Grammys (and a Grammy for the film's soundtrack, and another for a performance of 'What's Going On' with Chaka Kahn performed in the same concert that this Osborne bit is from). As well, bassist James Jamerson (widely regarded as the greatest bass player of all time) and drummer Benny Benjamin were posthumously inducted in the Rock and Roll Hall of Fame.